Dealing with any speeding ticket can be annoying. They can be both time-consuming and costly, especially if you have been stopped for excessive speeding, are an out-of-state driver, or if you already have multiple speeding violations on your driving record. Even without these circumstances, though, speeding can get you enhanced penalties if you are caught in a School or Work Zone. Speeding in a construction/work zones is a serious misdemeanor offense in Georgia. A knowledgeable and experienced local traffic defense attorney can help you explore your legal options and provide you with the representation you need. Nearly all states have laws that increase the penalties for speeding violations while in a school or construction work zone. In some states, the enhanced penalty consists of doubling the applicable fine had the same traffic violation been committed outside the school or construction zone. Other states, like Georgia, may have an enhanced penalty fine range, or a fixed dollar amount. Also in many states, including Georgia, the enhanced penalty is only applicable when workers are present, if signs are posted, or both. The Georgia Department of Transportation (GDOT) can designate a highway work zone or reduced speed zones in any county or city just by notifying that county or city. This means a work or reduced speed zone can pop up almost anywhere. A highway work zone is any highway or road that GDOT, a county or city, or some of their contractors is constructing, or maintaining. This may also include work on things close to the highway like utilities. When either a highway work zone or reduced speed zone is designated, work zone personnel must post signs at the beginning and end points warning the public of exactly where the enhanced speeding fines are in effect. This may include Reduced Speed Ahead signs if necessary. Work zone personnel must also cover or remove existing road signs that may cause public confusion. School zones are a special type of reduced speed zones normally located on the roads surrounding schools. Most school zones, like the ones in Gainesville and Hall County, have a 25 mile per hour speed limit, although some may be more. 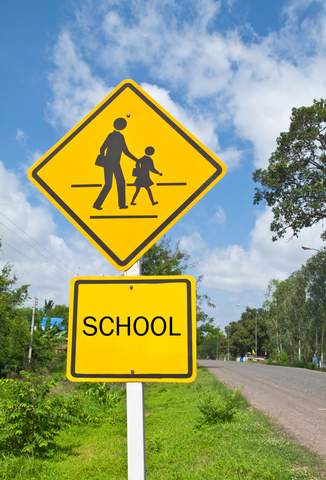 School zones are normally marked by yellow flashing lights and posted signs to make sure they catch the public’s attention. While school zones are usually only effective during certain times of the day, some places in Georgia have zero tolerance enforcement efforts for school zones, and places place extra officers in the areas around schools during those times. Reduced speed might be in effect, for example, from 7 a.m. to 9 a.m., and from 2 p.m. to 5 p.m.. This means that driving even 1 mph over the speed limit during those times may get you a ticket, while driving the same speed outside of the reduced speed times might not. – 6 points for between 34 mph or more over the speed limit. Speeding in a school zone is a serious misdemeanor offense in Georgia. By hiring an experienced criminal defense attorney, legal options and defenses can be discussed to see if a reduction is possible. Georgia Traffic Attorney, Anne Bishop, understands that highway work zones and school zones are established to keep the public safe. We understand that in cases like this possibly 12 months of prison, fines between $100 and $2,000, and higher insurance rates are all at stake. But, we also know that not every highway work zone or school zone gives the public the notice that Georgia law demands. We will thoroughly investigate your case, and work hard to gather the information you need to fight a work or school zone speeding ticket. Even more, we will make sure we give you every opportunity to understand that information, understand your Point Reduction options, and make a decision on whether or not to go to trial. For more information on A. Bishop Law Georgia criminal defense services, including speeding tickets, under 21 violations, DUI and Georgia Super Speeder citations, please email us or call us at 770-783-5296 if you have been given a citation for a speeding ticket or traffic violation. Your initial consultation is free & confidential.